Indianapolis, Indiana – Attorneys for Plaintiff, Terry Champ of Jackson County, Indiana filed suit in the Southern District of Indiana alleging that Defendant, The City of Seymour of Jackson County, Indiana infringed a work of visual art under the Visual Artists Rights Act (“VARA”). Plaintiff is seeking judgment in the amount of $150.000, attorney’s fees, and other relief the Court deems appropriate. In 2010, Plaintiff completed a 9-foot tall sculpture named Trinity, meant to symbolize the Holy Trinity in Christianity. The sculpture contains steel beams and a combination of gold and silver paint. The sculpture was sponsored by the city of Seymour, as part of an initiative to enhance various spots around town with artwork. Trinity was loaned to the city and then displayed at an intersection in town, until a member of the Department of Public Works requested it be removed. The sculpture was removed and stored in a garage, where Plaintiff eventually found it laying on its side in the gravel. 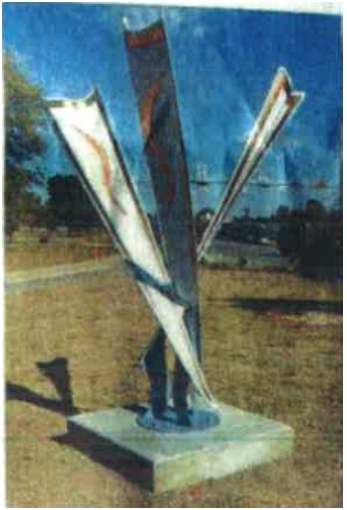 According to the complaint, the sculpture was damaged all over with scratches and gouges in the steel and bent parts. Plaintiff alleges that the city’s damaging of the sculpture violates VARA. He has requested statutory damages under VARA as well as other relief. The City of Seymour can be expected to assert the defense of sovereign immunity to this lawsuit. Sovereign immunity, as a general rule, bars lawsuits against states governmental entities. Sovereign immunity may be waived by a state for a particular type of lawsuit. The federal government may also abrogate states’ sovereign immunity with respect to certain types of claims. On the surface, this language appears to constitute an abrogation of states’ sovereign immunity regarding copyright infringement. However, the U.S. Supreme Court has held that “Congress may not abrogate state sovereign immunity pursuant to its Article I powers.” Florida Prepaid Postsecondary Educ. Expense Bd. v. College Sav. Bank, 527 U.S 627, 636 (1999). However, it appears that the Copyright Remedy Clarification Act has attempted to do just that. According to at least one recent decision out of a federal district court in Lexington, Kentucky, Article I is indeed what Congress relied upon to authorize the passage of the Act purporting to abrogate states’ rights with respect to copyright infringement lawsuits. This, the court held, rendered the attempted abrogation invalid. That litigation was consequently dismissed by the court as barred by the doctrine of sovereign immunity. In addition, several copyright infringement lawsuits by serial copyright infringement plaintiff Richard Bell have been rejected on grounds of sovereign immunity, including claims against Purdue University and Indiana University. The case was assigned to District Judge Richard L. Young and Magistrate Judge Doris L. Pryor in the Southern District and assigned Case 1:18-cv-01473-RLY-DLP.